Engagement. Not only is it the theme of the forum, it’s a solid description of the participants and our hosts… Engaged. Engagement = fundamentally a different view of customers. Engagement is about relevance. It’s about developing strategies to find, monitor, measure and leverage the opinions and behaviors of a brands’ interaction with their market influencers. 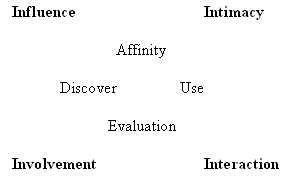 The emphasis of this model is to change the marketers view of the customer and the company’s relationship with them. The new view is a dialog. A dialog that involve motivated customers and gain their interaction with an organizations brand. The inner circle describes the process from the consumers perspective.